We’re delighted to once again be delivering a kids comedy workshop for the Manchester Literature Festival in October! The workshop is a fun introduction to comedy writing and improvisational skills suitable for kids aged 8-11 years. Kate and Sean will once again be facilitating the workshop at Z Arts in Hulme. They will show kids how to write and perform comedy, using improvisation as a writing tool, and finding comic inspiration from their lives and imaginations. To avoid cramping your children’s style, we ask parents not to stay in for the workshop. There is a nice café outside the room for adults that want to be close by. For the last 15 minutes of the workshop, adults will be invited in to watch a mini performance, so the young comics can show what they have been working on. As this is the Manchester Literature Festival we’ll also have our book available to purchase as well as lots of other lovely bits of merchandise! Our ComedySportz book includes a short introduction to core improv skills as well as some of our favourite games that you can play with friends and family at home. The book is also available to purchase at all ComedySportz shows! This kids comedy workshop is a ticketed event. Tickets can be purchased here. Why not make a day of it with the fantastic comic art masterclass with Kev Sutherland (the hands behind hit show Scottish Falsetto Sock Puppet Theatre) beforehand? Tickets can be purchased here. And if you think you might get jealous of all the fun the kids are having there are still spaces available on our Foundation in Improv course for adults starting 6th October. ComedySportz Summer Update and The Year Ahead! Well, as the dust settles over another busy summer for ComedySportz, we wanted to do a quick round up of our summer and all the shows, workshops and events we’ve got coming up for the rest of the year! Way back in June – it feels like a long time ago to us anyway – a small team of our players took part in the ComedySportz World Championship in Los Angeles. Manchester’s all female team defeated ComedySportz Houston in a hotly contested match of wits and players also reffed the matches between Sacramento, LA, Cincinatti and Austin! Every year the World Championship renews our commitment to the core values of ComedySportz Worldwide: Collaboration, Inspiration, Gratitude and Fun. Prior to the shows in LA, two of our players drove across the US to play with ComedySportz Boston (only 3 hours off the plane), Richmond, Philadelphia, Indianapolis, Quad Cities and St. Louis. It was an epic road trip and they loved getting to play with such dynamic and brilliantly funny people. Didn’t know ComedySportz was part of a worldwide family of shows? There are over 25 ComedySportz teams across the world, with more set to join the CSz family in the coming year – hello ComedySportz Las Vegas! The CSz Worldwide network gives us access to some of the best Improv skills and training which we channel into our own workshops and shows. In July, CSzUK produced the play Auntie & Me for the Greater Manchester Fringe. This deliciously dark comedy was well-received by audiences and was an absolute delight to once again bring to the stage. We were also delighted to have players from ComedySportz join ‘Whose Line Is It Anyway?’ legend Tony Slattery for his new show Crimes Against Improv. It was a wild and unpredictable night and it was an absolute honour to play with him. August saw ComedySportz Manchester return to the Edinburgh Fringe for the 11th year, performing two shows a day to fantastic crowds. We loved our time so much that we went back up at the end of the month with ComedySportz 4 Tots! …But 2018 isn’t over yet and we have lots of exciting shows, workshops and events coming up. First up, don’t miss Improv Mullet featuring special guest Nathan Jansen (Baby Wants Candy, iO, ComedySportz Chicago). Improv Mullet is our adults only show that combines short and longform improv comedy with quick gags and games in the first half and a whole improvised play in the second. We’re absolutely thrilled to have Nathan join us for this show and you really don’t want to miss it! As always, anyone with a genuine Mullet gets in for free. Improv Mullet. 1st September. 7.30pm. £3 on the door. The Kings Arms, Salford. Nathan will also be joining us for a one day workshop on Narrative Improv on September 1st and we also have a couple of spaces left on our two-day sketch writing workshop this weekend as well. Speaking of workshops, spaces are really starting to fill up on our 8 week Foundation in Improv and Beginning Stand Up Comedy courses commencing 6th October 2018. Whether you’re looking to develop new performance skills, improve communication and listening, build confidence or just want to rediscover play and have a laugh with new people then our workshops are for you! Find out more about all of our upcoming workshops and courses on our workshops page. We have plenty of upcoming ComedySportz shows at the Waterside in Sale and the fantastic new theatre space The Way in Atherton. If you’re looking for big laughs for really little kids be sure to check out ComedySportz 4 Tots at the Waterside as well! We celebrated 10 years at Waterside earlier this year and are really excited to be collaborating with The Way. We’ll be celebrating our 17th year with our annual return to Chorley Little Theatre in November. Tickets are available now! We’re also delighted to be continuing our collaboration with the University of Salford as The New Adelphi Comedy Night returns in September. Finally, to round out the year our Improvised Pantomime returns to the Waterside. We’re thrilled to be bringing back the show as it proved to be a real hit in 2017. You can find out about all of our upcoming shows here. Don’t miss this video with some of the highlights and reviews we received at this years Edinburgh Fringe Festival! As always, we were delighted to be part of the Free Fringe Festival and crowds were an absolute delight. Thanks to the staff and crew at our venues and thanks to all of our audiences – especially our volunteers! A highlight of our fringe was undoubtedly the musical suggestion of Jamilton that produced a musical about fruit preservatives and American history so wildy inaccurate and wonderfully funny that it went on for 15 minutes and only left the teams time for one more game! Unfortunately we didn’t film it so here are two videos of the teams playing Reunion which quickly became a favourite with players and audiences alike. Singalong if you know the words! We’re back in Edinburgh 24th-26th with ComedySportz 4 Tots as well as guest slots with our friends at Huggers and Comedy Club 4 Kids. An hours free childcare? You don’t want to miss this! Can’t make it to Edinburgh? Don’t worry, we’re back at the Waterside with ComedySportz and ComedySportz 4 Tots on the 25th August. Tickets are available now! Check out our shows page for more info. We’re having a blast at the Edinburgh Fringe with two shows a day jam-packed with quick-witted gags, games, sketches and songs inspired by our wonderful audiences. We’ve been delighted to be joined by ComedySportz players from across the world (Boston, New York, San Jose so far) and have had lovely crowds with some brilliant suggestions! All of our audience volunteers have been absolutely fantastic! Not seen a ComedySportz show before? Don’t miss out on our fast-paced all ages, all action, all improvised show where two teams compete for your laughs! There’s a referee on hand to ensure a good clean game with penalties for bad behaviour and bad jokes. It’s family friendly, it’s free and it’s very funny. Who wins? You decide! We’re part of the Free Festival because we believe audiences, especially families, should be able to see as many shows as they want without breaking the bank. You can find info on all of our upcoming shows for the Edinburgh Fringe on our shows page or at the Free Festival website. Catch some late night stand up with Tom Short in Comedy Shorts! If you’re looking to catch the future faces of British Comedy today then check out Comedy From Salford University featuring students that have all performed at our regular New Adelphi Comedy Night! 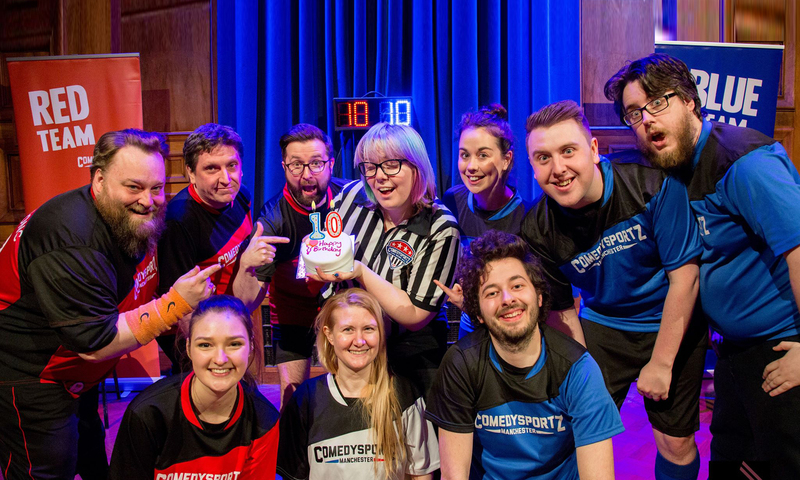 ComedySportz return to the Edinburgh Festival Fringe for another year of all action competitive comedy. After packed out rooms in 2017 we’re back with two shows a day to make sure as many people get to see us as possible! Once again we are part of the Laughing Horse Free Festival because we believe families should be able to see as many shows at the Fringe as possible without having to sell one of their kids to do so. This year’s official Fringe hashtag is #IntoTheUnknown so be sure to check out the Free Festival site as they have loads of great acts for you to discover. You can also find us listed on the Edinburgh Fringe website and app. Plesae note; there’s no need to book tickets, just arrive early to avoid disappointment. We’re also delighted to be bringing ComedySportz 4 Tots to the Edinburgh Fringe for the first time 25-26th August. It’s a last minute addition so you won’t find it in the official Fringe guide but full details can be found at the Free Festival Website. You can also catch us at Huggers (a great show for kids under 6, similar to our ComedySportz 4 Tots shows) and Comedy Club 4 Kids throughout the Fringe. Be sure to follow us on social media for any additional dates/appearances. We’re also delighted to be joined by ComedySportz players from around the world and some of our players will also be making guest appearances at other shows across the Fringe. For details on those shows be sure to be following us on twitter #cszed18. We’ll also be posting recommendations of other great Improv shows to catch in Edinburgh as well! Can’t make it to Edinburgh? Don’t worry, there are plenty of shows you can catch in across Greater Manchester. Check out our shows page for more info.